Bulldog™ offer a range six different High Temperature Wheels, ideal for use in the Food Industry and other applications requiring high temperature resistance. High Temperature Wheels are suitable for applications such as Bakery Oven Wheels, Industrial Oven Equipment and Autoclaves plus any other application requiring High Temperature resistance. The Wheels can be supplied as part of a Castor assembly, where High Temperature grease for bearings is used to ensure bearings do not wear excessively. Generally the bearings are also sealed to ensure no leakage of grease into the environment, which can be important in the Food Industry. They are generally suitable for speeds up to 3kph. Ditherm Wheels offer the highest temperature resistance of our range of High Temperature Wheels. Manufactured from special synthetic fibres by moulding under extremely high pressure and temperature to provide a hard material which is extremely durable and resistant to high temperatures. Ditherm is resistant to water, many solvents, oils, fluids and chemicals. Ditherm is able to accommodate thermal shock, for example a fast change in temperature. They are also certified for the food industry, making them excellent High Temperature Wheels for Walk-In Bakery Ovens and Similar. The most popular wheel, rated between -40ᵒC and 280ᵒC for continuous use, and up to 300ᵒC for short term peak temperature. They are available in 6 sizes from 80mm diameter up to 200mm diameter, with load capacity upto 520Kg for the largest size. A special material compound which can withstand up to 400ᵒC for short term peak temperatures. It is available in 100mm diameter, with a load rating up to 180kg. 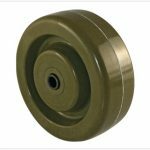 Phenolic Wheels are manufactured by impregnating macerated fibres with phenolic resin, and moulding under high pressure and temperature. The resultant is hard high temperature wheels, ideal for carrying heavy loads. They are particularly suitable for carrying stationary heavy loads for prolonged periods without any permanent set of the wheel. It should be noted however Phenolic Wheels may chip if used on rough surfaces or if they impact another object. These are designed with Load Capacity as the primary characteristic. 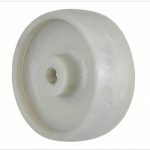 The material formula of the fibres and phenolic resin is designed to provide a high strength, high load capacity wheel. The temperature range is however reduced considerably, to 30ᵒC to 120ᵒC. 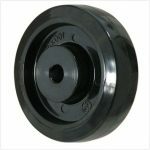 They are available from 75mm Wheel diameter up to 200mm diameter with a load capacity of 725kg for the largest wheel. These are designed with High Temperature Resistance as the primary characteristic. The formula of the fibres and phenolic resin are design to provide a high strength, high temperature resistance wheel. The Load capacity is however reduced considerably, to 360Kg for the largest 200mm Wheels. They are available from 75mm diameter wheel up to 200mm diameter wheel with a temperature range of -30ᵒC to 250ᵒC, with short term peak temperatures up to 300ᵒC. As the above Phenolic Wheels, the same process is used for the Rubber Tread Phenolic Wheels, by manufacturing Phenolic impregnated fibres, but with the addition of chemically bonding a high temperature rubber tread to the wheel. 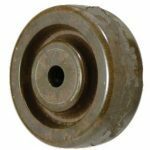 This wheel is available in 100mm diameter, can carry loads up to 110Kg per Wheel and has a temperature range of -30ᵒC up to 250ᵒC. The addition of the rubber tread offers two distinct advantages. Firstly the rubber provides reduce noise operation, which may be important in certain environments such as Schools or Hospitals. 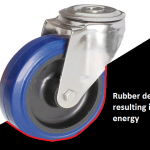 Secondly, the rubber provides the Phenolic wheel from damage is used on rough floor surfaces. Solid Black Thermoplastic Wheels are an economical choice. They offer excellent value, providing a temperature range of -40ᵒC up to 300ᵒC with Load Capacity up to 650kg for the largest size. They are available from 80mm diameter up to 200mm diameter. 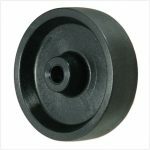 Black Thermoplastic is an excellent material and is superior to most standard castors wheels, however it should be noted that compared to the other High Temp Castor Wheels in this article the wear resistance, fatigue life and shock resistance are reduced (however they are still very good!). Epoxy Resin Wheels, similar to Phenolic Wheels, offer an extremely robust, durable wheel that can endure extreme use. Epoxy Resin is shock and impact resistance by nature and is resistant to most chemicals, cleaning fluids, water and steam. Epoxy wheels provide excellent non-marking properties to protect flooring surfaces. High Temp Polyamide Wheels are designed with load capacity is the primary characteristic. The Wheels are manufactured from Fibre Glass filled Polyamide 6, which provides an extremely head wearing, shock and impact resistant wheel. They are available in 5 sizes, ranging from 80mm wheel diameter, up to 200mm diameter wheel, with the largest wheel carrying up to 900Kg. The temperature range is lower than most of the other wheels in this article, with a range of -30ᵒC up to 150ᵒC. 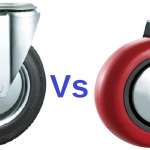 Rubber Castors Vs Polyurethane Castors ? Do you need Replacement Castor Wheels ? We offer one of the largest ranges of castors & wheels in the UK, which can be manufactured in various different tread materials, sizes, fixing types & variations. Bulldogcastors.co.uk has a great deal of experience in the castor industry, and general engineering / Industrial industry, and our engineers are at hand to help you with any new projects or developments that may be required. If you need help in selecting the correct castor, please contact our technical department. Our Online Web-Shop shows a limited range of the most popular castors, however we have many 1000’s of different type available. We Provide Castors and Wheels UK Wide England, London, Birmingham, Manchester, Leeds, Bristol, Glasgow, Liverpool, Sheffield, Edinburgh, Leicester, Coventry, Nottingham and New Castle. Bulldog Castors © 2016. All rights reserved.